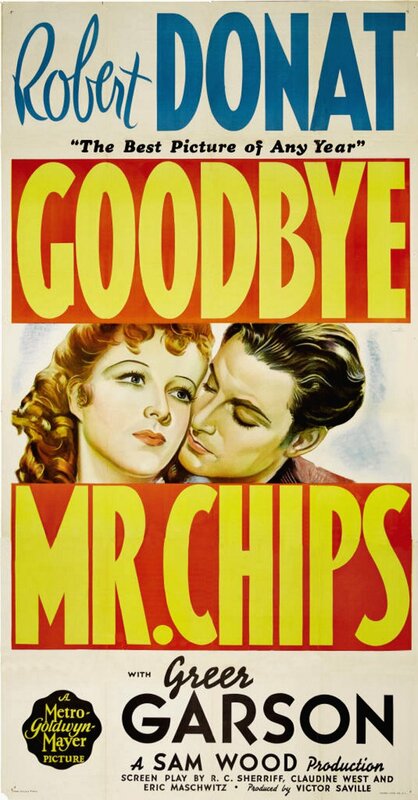 Poster from American first run. “Scrooge” (Renown, 1951) is far and away the best movie adaptation of “A Christmas Carol.” Of the dozens of things that are wonderfully right with this adaptation, I want to focus on three. First, there is the masterful Alastair Sim, who for forty years was one of the wittiest and most resourceful clowns in British pictures. Second, there is the excellent script by Noel Langley, who was the head writer for “The Wizard of Oz” (and who, by a happy coincidence, was born on Christmas Day). And third, there is the superb musical score by Richard Addinsell. This opening scene, I think, offers abundant evidence of the general excellence of Noel Langley’s screenplay. Peter Bull’s voice-over narration is a much abridged version of Dickens’ opening paragraphs, but the conversation among Scrooge and the two businessmen is entirely Langley’s invention. To my ear, it all sounds perfectly Dickensian while it provides a great amount of exposition without sounding the least bit expository. I particularly like Scrooge’s encounter with the deadbeat debtor: “I don’t conduct my affairs in the teeth of inclement weather” is Langley’s invention, but it’s hard to believe Dickens didn’t write the line himself. There is an anachronism in this scene, however: August Bank Holiday was established in 1871, approximately twenty years after “A Christmas Carol” was written. Here is the scene in which Scrooge is visited by the ghost of Jacob Marley (Michael Hordern). Alastair Sim’s two minute pantomime of mounting dread while balancing a bowl of gruel on his lap is a masterpiece of comedic acting. Sim has a wonderfully mobile, expressive face — nobody ever goggled better — he can make you laugh out loud by the way he raises his eyebrows or lowers his lids or lets his jaw go slack, but he never, ever pulls cartoon faces. All of his reactions are firmly based in the reality of Scrooge’s terrifying predicament; Sim’s facial expressions and body language convey Scrooge’s growing terror with incredible specificity and clarity; his wordless comic moments are miracles of eloquence, but most of all, they are hilarious. At the beginning of the clip below, when he first hears the spectral voice call his name, Sim very carefully lowers his spoon to let its revolting contents spill back into the bowl that he has perched on his lap; when the spoon is empty, he releases it and it, too, plops into the bowl. And you can see he’s already taken the first uneasy steps along the path to abject terror. It’s a brilliant little piece of business: he presents us with a physical manifestation of fear that is both realistic and funny, while also making sure we see that the gruel he’s trying to eat is incredibly thin — a droll reminder of the appalling extent of Scrooge’s miserliness. It’s also a perfect illustration of one of the most fundamental principles of comic acting: “Show the Props.” Great comic actors always do wonderful things with the props they handle. Show me an actor who dislikes working with props and I’ll show you an actor who isn’t funny. In this scene, and throughout the rest of the picture, Sim uses props to reveal character. After he drops the spoon, pay close attention to how precisely he charts the course from disquiet to dread to alarm to fright to wild-eyed panic. As a demonstration of sheer technical skill, it’s a tour de force: but it’s more than technical virtuosity: it’s also full of humanity and it’s riotously funny. Sim is endlessly surprising; he never stops catching you unawares, yet his surprising choices always make perfect sense. For my money, this scene has some of the best acting ever put on film. Most moviegoers rarely notice musical underscoring. Ask the average moviegoer to tell you what he thought of the plot and the dialogue of the last picture he saw, and most likely he’ll have an opinion about their relative merits; ask him about the quality of the acting, and he’ll be able to tell you whom he liked and whom he didn’t. But ask about the score and he’ll say he didn’t notice it, even though there’s a good chance that there was a lot more music than dialogue on the soundtrack, and an even better chance that the music was atrocious. Unfortunately, for those of us who haven’t learnt the trick of tuning out bad music, scoring in pictures is a constant source of anxiety. Indeed, far from learning how not to hear underscoring, I’m more aware of it than ever before. A good score is often enough to make me enjoy an otherwise idiotic picture (for instance, I’m so crazy about André Previn’s score for the endlessly tedious “4 Horsemen of the Apocalypse” that I nearly always watch it till the bitter end), but no picture is great enough to survive a bad score. (“The African Queen” has a score I loathe; fortunately, it’s used infrequently enough that it doesn’t spoil the entire picture for me. When it’s parping along, however, I have to remind myself to stop grinding my teeth.) There are three or four composers working today whose names are enough to prevent me from paying to see the picture in a theatre. It’s my belief that Richard Addinsell’s score for “Scrooge” has at least as much to do with the picture’s overall greatness as the stunning performance by Alastair Sim. The only difference is that Addinsell’s work is so fine that its effect is almost entirely subliminal. In the clip below, the music doesn’t come in until Scrooge leaves the counting house. But listen to how marvellously the bass clarinet suggests Scrooge’s personality and temperament, but without being too intrusive or insistent. Addinsell’s score adds weight and atmosphere, but it doesn’t tell you how to feel. In the afternoon he [Scrooge] turned his steps towards his nephew’s house. Dear heart alive, how his niece by marriage started! Scrooge had forgotten, for the moment, about her sitting in the corner with the footstool, or he wouldn’t have done it on any account. After the detailed account of Scrooge’s arrival and his conversation with the maid, Dickens hurries over the rest of the party, giving us only the atmosphere of boisterous jollity and goodwill, which he sends dancing by us in a swirl of anaphorae (Three iterations of “So did . . . when he/she/they came”; four iterations of “wonderful”) — and leaving us to imagine the details. Now here is how the scene is presented in the picture. 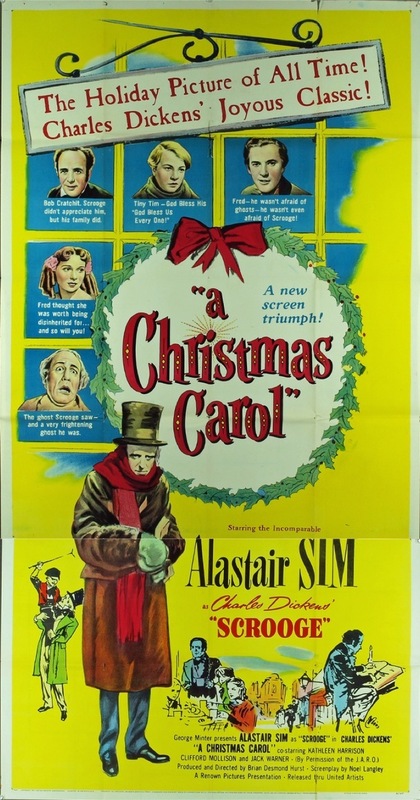 The tune we hear is “Barbara Allen.” This is what happens when you put Alastair Sim together with a brilliant screenplay and an exquisite musical score. Throughout the picture, “Barbara Allen” is used as the leit motif for Scrooge’s beloved sister Fan, who died while giving birth to Nephew Fred. So when Scrooge arrives at Fred’s house, the tune is already familiar to us (very possibly, only subliminally), and it sets up our anticipation of the catharsis we know is about to come. The pairing of the viola and cello in the opening bars — so simple, so noble, so gracious and heartfelt — is almost unbearably moving. The maid’s wordless performance — especially the kindliness of her smile — is a thing of beauty. Then comes the moment of the Sublime: Scrooge takes his first look at his beautiful niece, the mildness of Sim’s eyes while he takes her in, his half-humorous regret at all the wasted years, the beauty of Sim’s voice as he asks for her forgiveness, and finally, the return of the low strings playing “Barbara Allen,” the beautiful way the niece responds, her ravishing smile, the gentle way she kisses him — it’s absolute perfection. The Sublime. By the way, Fan’s death in childbirth is another one of Langley’s inventions. It has been featured in so many adaptations that it comes as a surprise that nothing of the sort occurs in the book. Indeed, the entire notion of approaching Scrooge’s coldness and miserliness as subjects for psychological analysis is Langley’s. Dickens tells us only that at some point in Scrooge’s young adulthood, his fiancee (she’s nameless in the book; Langley calls her Alice; in other adaptations, she has often been named Belle) accuses him of having become more concerned with accumulating wealth than with loving her, and breaks off their engagement. How Scrooge left Fezziwig’s employ, how he rose in the world, how he grew hard — all contributions by Langley: Dickens explores none of these things; he gives us the results, not the influences that led to them. Langley’s approach, then, is entirely alien to Dickens, yet he succeeded so brilliantly that every post-1951 adaptation that I’ve seen follows Langley’s model more closely than Dickens’ own. This entry was posted in Main and tagged 4 Horsemen of the Apocalypse, A Christmas Carol, Alastair Sim, Andre Previn, Ernest Thesiger, Michael Hordern, Noel Langley, Peter Bull, Richard Addinsell, Scrooge, The African Queen, The Wizard of Oz on December 23, 2013 by TR.